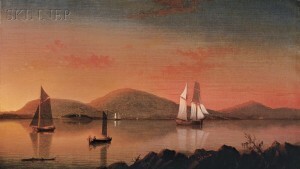 Fitz Henry Lane Auction Results | Skinner American & European Works of Art Auction Grosses $3.2 Million | Skinner Inc.
Skinner remains a leader in the sale of works by the American painter and printmaker Fitz Henry Lane. The September 20th auction featured Lane’s Camden Mts. From the Graves, which sold for$1,384,000. In 2004, Skinner achieved a world-record price for the artist, with the sale of Manchester Harbor, for $5,506,000. Also performing strongly was the The Robert Bunting Dance Collection, more than 150 lots of paintings, drawings, sculpture, prints, and photography pertaining to ballet and modern dance. The distinguished collection, spanning the 17th century to the present day, had a sell-through rate of 99% (by value), smashing its high estimate. The Jerome Robbins Dance Division of The New York Public Library for the Performing Arts purchased several works from this collection. Many of the auction’s top lots came from this single owner collection, including a costume design by Léon Bakst for the marchioness in The Sleeping Beauty, which sold for $66,000, more than quadrupling the pre-sale high estimate. Also performing well was Pavel Tchelitchew’s Group of Dancers in a Scene from L’Errante, which sold for $26,400, well over the $1,500-$2,000 pre-sale estimate; and a poster maquette by Georges De Pogédaïeff for the Ballets Russes de Monte Carlo, which doubled the low estimate, fetching $20,400. Skinner has been expanding its offerings of prints, multiples, and works on paper and saw excellent results for this material on September 20. Old Master prints had a good showing, highlighted by the sale of Rembrandt van Rijn’s Beggar in a High Cap at $14,400, far exceeding the presale estimate of $800-$1,200. Modern and contemporary works also sold well, including Chuck Close’s Phil I (White), which sold for $60,000. Kandinsky’s Kleine Welten IV more than doubled its high estimate, bringing $15,600. Skinner auctions draw international interest from buyers and consignors alike, with material regularly achieving record prices. The company’s auction and appraisal services focus on fine art, jewelry, furniture, and decorative arts from around the globe, as well as wine, fine musical instruments, rare books, clocks, Judaica, and more. Monthly Skinner Discovery auctions feature a breadth of estate material. Widely regarded as one of the most trusted names in the business, Skinner appraisers have appeared on the PBS-TV series, Antiques Roadshow, since the show’s inception. 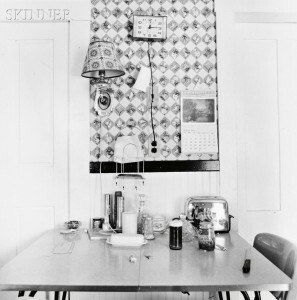 Skinner has galleries in Boston and Marlborough, Massachusetts, with an international audience of bidders participating in person, by phone, and online through the SkinnerLive! online bidding platform. 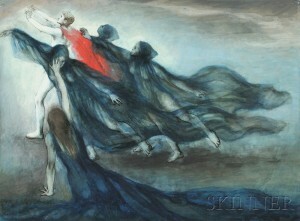 For more information and to read our blog, visit the website at www.skinnerinc.com, find us on Facebook at https://www.facebook.com/skinnerauctions, or follow us on Twitter @Skinnerinc. This entry was posted in News and tagged American art, auction results, ballet art, Ballet Russes, Chuck Close, Contemporary Art, contemporary artists, dance art, dance collection, european art, fine art, Fine Paintings, Fine Prints, fine sculpture, Fitz Henry Lane, Michelle Lamuniere, modern art, old masters, Photography, Robert Bunting, robin starr, Walker Evans by Skinner. Bookmark the permalink.